Willpower isn’t something that I always have. However, I have caught myself lately literally talking to myself and saying, “You can do better.” It’s all about food. I want to lose weight, but I don’t always make the right choices to actually want to lose weight. I’ve been stuck at this same number for quite some time. I’m not shy to share it….175. I started at about 185 when I first decided to work out and eat better. I got down to less than 170 when I trained for the mini last year. Then I put some pounds back on over the winter. Then I started again in January and said I was going to quit drinking beer and quit eating French fries and potatoes and bread. The problem is….I haven’t always had the willpower. Therefore, I am stuck around 175. Just yesterday I got under at about 174.6. Losing over 2 pounds in one week made me thrilled, but my first thought was how badly I wanted a double cheeseburger from McD’s. I have this problem every time. But then I remembered the willpower I had been working on. I drove right past McD’s and went home. I cooked dinner at home, for myself and chose the healthy route. I wanted a beer when I got home, especially after finding out we had a two hour delay but I remembered that I was going to a Pacer’s game tonight and out to dinner on Saturday night….so I chose a Vitamin Water instead. I say compromise because I will continue to enjoy life. Which means that every once in a while I am going to have a beer. I love Blue Moon. I mean….I drool when I see a cold Blue Moon with an orange on top. Also, I may occasionally eat at McD’s and enjoy a double cheeseburger….but it has to be less often if I truly want to lose the weight. If I can go home and eat, then I need to choose that option. If I know that I’m going to want to drink a beer when we are out with friends or family, then I’m going to have to say no to a beer in the fridge at home. Otherwise, I’m going to continue to struggle and sit at 175. Right now my goal is to get under 170. If I can reach that goal then I’ll shoot for 160. I’m focusing on 10 pounds at a time. Sure, I’d love to be a size 6 by the summer, but let’s be real here. Maybe a size 12 instead? Size 14 looks good on me, I’m told by my wonderful man. He could care less what size I am. I think he enjoys my curves. But with a pool in our backyard I sure would feel better in a swimsuit without a few pounds attached to these rubbing genie thighs. Here’s what I’ve done so far to try and get there…. Since January I have had two scrambled eggs and coffee for breakfast. My trainers tell me I must eat breakfast. I hate taking time to sit down and eat in the morning…I’d much rather sleep longer. But it seems the protein in the morning helps to get my metabolism going. Also since January I have started a new lunchtime meal. It has saved me so much trouble, and I’m still in love with it. 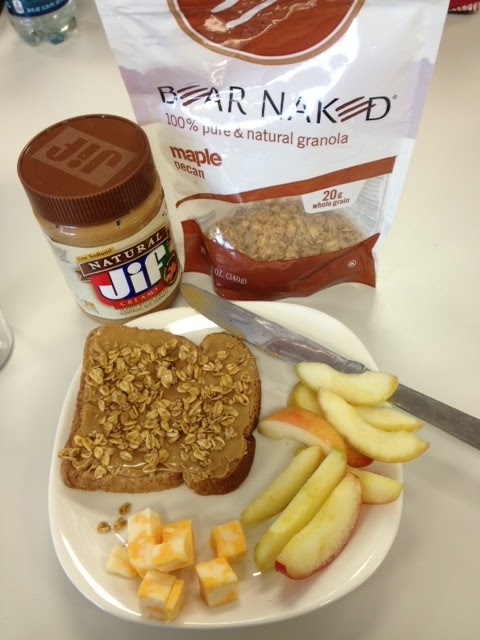 Meet my new lunch time favorite…. Healthy Life bread (one slice) only 35 calories. Bear Naked Maple Pecan granola 1/8 of a cup is 65 calories. Colby Jack cheese cubes or cheese square around 80 calories. Natural Jif creamy peanut butter 2 tablespoons 190 calories. Apple slices around 90 calories. Total for my daily lunch is 460 calories. This is all according to MyFitnessPal which I have also been using daily to help me keep track of my calories and try and stay under 1300. Most of the time I am under 1200 or even 1100, but my dearest trainers gave me a goal number of 1300. Right now the scale is back and forth. It’s annoying. Really annoying. But I was really proud of myself last night, AND again today when I passed up McDonald’s and came home to eat something healthier. I’ve got to stop making excuses. And I have to stop eating the junk so when I do go out to eat at a nice place, or out to enjoy a sports game, I can really enjoy a beer and some junk food because I have actually been good all week. Wow….as I just read back through this I cannot believe I’m telling y’all my weight and laying it all out there. I guess I feel like writing it down helps hold me a bit more accountable.